Hungry Chicken is a child-friendly and easy to play ticket redemption game from Andamiro that is suitable for 1-2 players. Hungry Chicken has an fun and exciting cabinet design featuring bright colours,friendly characters and LED lighting. The cabinet controls are simple, simply one button to press! The aim of Hungry Chicken is to use the controls to beat the Challenge Score and win bonus tickets! This simple ticket redemption game is suitable for younger players and will be the perfect addition to any family entertainment center, arcade or kids club. The bright colours, characters and LED lighting will attract players to try to game and the easy gameplay will encourage repeat play in order to beat the high score and win the most tickets! Hungry Chicken is a child-friendly and easy to play ticket redemption game from Andamiro that is suitable for 1-2 players. Hungry Chicken has an fun and exciting cabinet design featuring bright colours,friendly characters and LED lighting. The cabinet controls are simple, simply one button to press! The aim of Hungry Chicken is to use the controls to beat the Challenge Score and win bonus tickets! This simple ticket redemption game is suitable for younger players and will be the perfect addition to any family entertainment center, arcade or kids club. 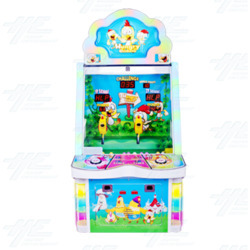 The bright colours, characters and LED lighting will attract players to try to game and the easy gameplay will encourage repeat play in order to beat the high score and win the most tickets!